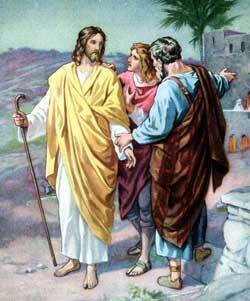 Jesus meets two men on the Road to Emmaus who do not recognize Him. They explain why they are so sad. The men began to tell this stranger about Jesus of Nazareth whom they had hoped would deliver their nation from the rule of the Romans and set up a kingdom. They told him how the chief priests and rulers had become jealous of him because he was such a mighty prophet, and how they captured him and caused him to be crucified. They told him that Jesus had died on the cross and that his body had been buried by loving friends in a nice, new tomb. The stranger listened patiently, and when they had finished he began to talk to them about the teachings of Moses‘ law and of the prophets concerning the promised Redeemer of Israel. He showed them by the word of God’s book that Jesus, the prophet of Galilee, should suffer these very things and rise again the third day if he would really be the Redeemer for whom they were longing. And the men listened silently, wondering who this stranger could be. Presently they came near to the village of Emmaus, and the two men asked the stranger to stop with them until the next morning, as the day had nearly ended. So he stopped with them. And when they sat down to eat their evening meal he took bread, blessed it, and gave it to them, and they knew at once that he was Jesus, their risen Lord. But he disappeared from their sight. Now the two men understood why the women who had seen the angels seemed so full of joy. They, too, believed in the risen Lord, and their hearts were filled with gladness. They rose up from the table and hurried back to Jerusalem to tell the disciples that they had seen the Lord. The deep shades of night had fallen over Jerusalem when the men at last came to the house where the disciples and some of their friends were gathered together. When they entered the room they saw that a change had come over these people who had been so sad. Then the women told how he had appeared to them on their way to Emmaus, and how they had not known him until he had blessed and broken bread at their evening meal. While they talked together suddenly Jesus himself appeared in their midst. And they were frightened, for the doors were closed when he entered and they supposed he was a spirit. Then he asked for something to eat, and they gave him a piece of fish and some honey, which he ate before them. Great was their joy on beholding him once more in their midst, after they had seen him so cruelly tortured and killed. But Thomas, one of the disciples, was not present when Jesus appeared. And he would not believe when the others told him that they had seen the Lord. A week passed by, and again the disciples were together in a room, the doors being closed, and this time Thomas was with them.